A circle is a round, two-dimensional shape. All points on the edge of the circle are at the same distance from the center. The radius of a circle is a line from the centre of the circle to a point on the side. Mathematicians use the letter r for the length of a circle's radius. The centre of a circle is the point in the very middle. The diameter (meaning "all the way across") of a circle is a straight line that goes from one side to the opposite and right through the centre of the circle. Mathematicians use the letter d for the length of this line. The diameter of a circle is equal to twice its radius (d equals 2 times r). The circumference (meaning "all the way around") of a circle is the line that goes around the centre of the circle. Mathematicians use the letter C for the length of this line. The number π (written as the Greek letter pi) is a very useful number. It is the length of the circumference divided by the length of the diameter (π equals C divided by d). As a fraction the number π is equal to about ​22⁄7 or 335/113 (which is closer) and as a number it is about 3.1415926535. The area of the circle is equal to π times the area of the gray square. 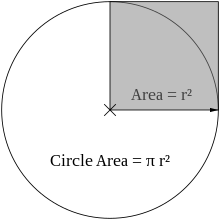 The area, a, inside a circle is equal to the radius multiplied by itself, then multiplied by π (a equals π times r times r). π can be measured by drawing a large circle, then measuring its diameter (d) and circumference (C). This is because the circumference of a circle is always π times its diameter. Wikimedia Commons has media related to Circle. This page was last changed on 6 March 2019, at 18:29.